Maintaining your health requires a multi-disciplined approach. You need to eat a healthy and well balanced diet, exercise every day and get seven or eight hours of sleep at night. But even with all of that, your overall health may be at risk if you’re not taking good care of your oral health. Dentists and physicians know that your mouth plays an important role in the health of your body. In particular, the condition of your gums can be a telltale sign. Fortunately, gum disease therapy can eliminate the bacterial infection that has been linked to several bodily illnesses and diseases. If gum disease only affected your mouth, that would be trouble enough. In fact, gum disease is the leading cause of tooth loss among adults in the United States. At the start of gum disease, bacteria invade the soft tissue around your teeth. As this bacterial infection advances, you may begin to notice that your gums become red and puffy. They may even bleed when you floss. Left untreated, periodontitis sets in. At this stage, bacteria begin to destroy tissue below the gum line, including the alveolar bone that supports your teeth. Without gum disease therapy, tooth extraction may be unavoidable. With bleeding gums, the bacteria that cause gum disease can leach into your circulatory system to cause these and other medical complications. If you have periodontitis, laser treatment is one of the most effective and comfortable forms of therapy. Using a laser, your dentist has no need for a scalpel. The laser targets only diseased tissue, reduces bleeding as it cauterizes blood vessels and it even kills bacteria on contact. 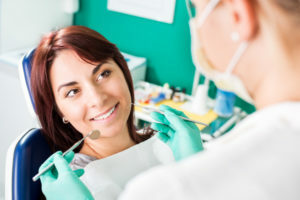 In addition, laser treatment for gum disease promotes the regeneration of healthy, new gum tissue that will snugly wrap around your teeth so bacteria can no longer accumulate in pockets. Of course, the best defense against gum disease is a good offense. Brush your teeth at least twice a day with a soft brush and fluoride toothpaste. This removes bacterial plaque from tooth surfaces. To remove plaque from between your teeth, you must floss. Be sure to floss all the way down to the gum line, but don’t use too much pressure. If you’re noticing that your gums are a little red or swollen, then it’s time to see your dentist. Gum disease therapy may be necessary for the health of your smile and your body. Dr. Brian Lee is an award-winning general, cosmetic and restorative dentist. His goal is to provide care in a judgment-free environment so patients can achieve great oral health and general health. If you have any questions, he can be contacted through his website or at (678) 496-2539. Dr. Katherine Lee Dr. Brian Lee Canton GA Dentist (770) 213-8166 (770) 213-8157 Monday 8:00am - 5:00pm, Tuesday 8:00am - 5:00pm, Wednesday 8:00am - 5:00pm, and Thursday 8:00am - 5:00pm.